State officials warned Tuesday that a tiny jellyfish that can pack a dangerous and painful sting has been found in the Metedeconk River in Brick. 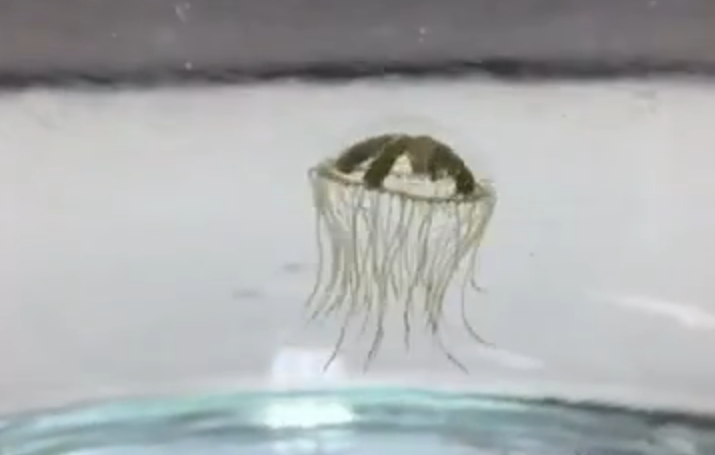 The clinging jellyfish, a dime-sized invasive species, was found in the river off a private dock, the Department of Environmental Protection said in a statement released Tuesday. Researchers found 15 of the jellyfish near the dock in question and, in turn, issued a “recreational use advisory” to the river. Clinging jellyfish have been previously found in the Manasquan River near the mouth of the Point Pleasant Canal, as well as in the Shrewsbury River in Monmouth County. A fisherman found one in Barnegat Bay two years ago. This is the first time the species has been found in the Metedeconk, which empties into the bay. The clinging jellyfish, a native to the Pacific Ocean, is small and very difficult to spot in the water, officials said. A sting can produce severe pain and other localized symptoms and, in some cases, can result in hospitalization. The species is not known to inhabit ocean beaches or other sandy areas, but tends to attach itself to submerged aquatic vegetation and algae in back bays and estuaries – areas that are not heavily used for swimming. Officials from the DEP are now conducting more intensive surveys of the river as well as the northern portion of the bay to see if any more of the jellyfish can be located. The clinging jellyfish ranges from the size of a dime to about the size of a quarter, according to the DEP. It has a distinctive red, orange or violet cross across its middle, but is notoriously difficult to spot in the water. Both the adult, or medusa, and polyp stages of the clinging jellyfish are capable of stinging, a mechanism the species uses to stun prey and to defend against predators. Each jellyfish can trail 60 to 90 tentacles that uncoil like sharp threads and emit painful neurotoxins. Tentacles grow to be about three inches long. Clinging jellyfish primarily feed on zooplankton. Clinging jellyfish do not swim or migrate but can be spread by boats and in ballast. They were first observed in the eastern Atlantic at Woods Hole, Mass. By the 1920s, they had spread to other waterways in Massachusetts and Connecticut, likely through introduction by ship ballast or from Pacific oysters containing polyps. If you see a clinging jellyfish, do not try to capture it, the DEP officials warned. Take a photograph if possible and send it to Dr. Paul Bologna at bolognap@mail.montclair.edu or Joseph Bilinski at joseph.bilinski@dep.nj.gov along with location information. Montclair State University has been assisting the DEP with its study on the clinging jellyfish population.